Thanks to the various sources from where these snippets come. 7) Aka as Jungle Windo as on the New York Gong version which had Gary Windo on sax. Thanks a lot ! 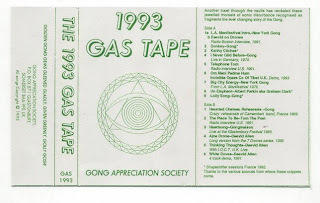 I'm looking for the 96 GAS tape... Maybe you can help ? How goes it? I just stumbled upon our blog via madshoes blog whom I have made strong links with recently asfter tracking various albums from their wishlist. Therefore I am writing to ask if you would like to exchange links and become good link partners. If this meets your merits, drop by my blog at http://www.raremp3.co.uk/ and let me know what you think. Any chance of a re-up of this? Thanks and love the blog. RS.com links are down - any chance of a re-up? EXCELENT BLOG ! REGARDS FROM BUENOS AIRES!